Written as a letter to her son, Robbie, this novel tells the story of Annie Black whose seemingly idyllic life with her husband and three children is disrupted when a photo from her past arrives in the mail. It isn't the photo itself that outlines any possible transgression, but rather the events that surround it. It is the beginning of the unraveling of her life, and Annie is forced to reflect on her past and the choices she has made. There were very few surprises in A Small Indiscretion. From what that "small indiscretion" could be (it's pretty obvious almost right away) to the role various characters played in the story and the actions they would take. Still, I was never exactly sure of Robbie's fate or what direction the author would take the story, especially in the end. There's the unhappily married couple, Malcolm and Louise, the mysterious and somewhat charming Patrick, Annie's ever reliable husband Jonathan, their best friend Mitch, and Emme, the wayward stranger turned employee. The biggest draw for me to the book was not just the beautiful writing, which I found compelling and thought provoking, but also the characters themselves. I felt a certain disconnect with all the characters in the novel, but I am not sure that is a bad thing in this case. As Annie recalls the events from her past and ties them to what is going on in her life in the present, she is trying to be as objective as possible in terms of laying out her memories of what happened, why she made the choices she did, and the consequences that came after. She holds nothing back, not even in taking blame for her own actions. I liked that that the author brings into question the validity of memories. This was a more minor point really, given the circumstances, but one can't help but wonder how reliable are memories really? The author brings this point up late in the novel, which at first I thought wasn't really fair as I would like to have seen that side of the story explored more. And yet, the more I thought about it, the more I thought perhaps it was well-placed, this doubt the author suddenly had thrown my way. It gave me a chance to reflect on what had happened up to that point and re-evaluate my assessment of Annie. I admit that Annie Black did not endear herself to me, not as a young woman trying to find her path in life nor really the more mature family oriented version of herself--and yet I was fascinated by her and could not help but feel pulled into her story. She was at times reckless and selfish (but aren't we all selfish to some degree?). I could understand why Annie made the choices she made even if I didn't always agree with them. I came to care about her as time went on. I saw a young woman, trying to make her way in the world on her own, but getting lost in loneliness and insecurities. She used alcohol as a balm. It was easy to see how she could get caught up with Malcolm and Louise and Patrick: Louise and Malcolm with their broken marriage, both of them pathetic and sad, really; and Patrick who seemed less a mystery artist type and more of a poser to me. In the present, Annie is married to Jonathan, a doctor and loving husband. She feels as if she should be happy. She has a thriving business of her own, and yet there are moments when she feels restless and cannot help but wonder what might have been. When the photo arrives in her mailbox it brings it all back full force, however. It seems to be the domino that sets the other dominoes falling. She is forced to face secrets she has long kept hidden. Annie feels helpless and alone with the life she's built falling apart around her. Jan Ellison does an amazing job of bringing out the inner turmoil Annie was and is feeling as well as giving us a good idea of what the other characters must have been going through too. Even Jonathan, who seemed more like a victim in all of this, isn't perfect by far. There is a scene near the end in which it becomes even more clear how the pieces of Annie's past fall into place--and I couldn't help but think of Jonathan's own past and how little we know about that and yet how he, like Annie, has his own ghosts, even if maybe not quite as prominent. It's another reminder of how the choices we make early on in our lives can impact us--as well as others--years later. A Small Indiscretion hit two of my buttons in terms of topics that make me uncomfortable to read about because I have such strong opinions on them, one of which I suspected but decided to take the plunge anyway. I like to avoid those topics generally, but occasionally I think it's good to take them on, not just to challenge myself but also to take in a different perspective. I had mixed feelings about the novel when I finished it. I loved the writing, but the novel left me in a dark place. At the risk of spoiling the end, it wasn't a particularly sad ending. It was more promising and hopeful than not. Still, I couldn't help but feel sad and a bit hollow as I finished reading it. Maybe even exhausted. I carried Annie and Jonathan and Robbie with me even after I finished the last page. 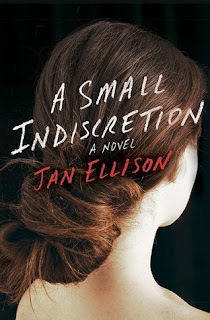 Annie may have frustrated me more often than not, but Jan Ellison's novel was quite compelling and thought provoking. Most of all, what I took away from this novel is about the role forgiveness can ultimately plays in our lives. Not just forgiveness of those we love, but also of ourselves. To learn more about author Jan Ellison and her work, please visit the author's website. You can also find her on Facebook and Twitter. Source: I received an e-copy of this book from a publicist for an honest review. Hm, I think I know what her indiscretion is. The format of the book and the characters do make it sound worth reading. Kathy - While the indiscretion may be obvious, it's still worth reading. It's much more complex. I am glad I read this novel. Based on what I've read in this post, I already have a guess about what the revelation about the "indiscretion" is. I do like the premise though, and I enjoy epistolary novels. And your description of the writing style is a huge draw. Great review! Irene - It's not a well kept secret, even in the beginning, at least not for the reader. Fortunately, the book is much more than about that "indiscretion". I liked the book over all, especially the writing. I'll be curious to see what the author comes out with next. Great review, this is definitely one I'll keep a look out for as I to have my thoughts on the 'discretion' and would like to know if I'm right. The validity of memories has been on my mind lately after a conversation with my dad about something that had happened a number of years ago. I remember it one way and he remembers it completely differently though our memory of the actual even is the same. It's weird how that works. This looks like an interesting book though maybe a little to introspective for my summer fried brain. I'll have to put it on my list for when school starts back! Katherine - Memory really is an interesting subject isn't it? So much can influence memory, not to mention how differently we each can perceive the same situation. If you like the lighter reads for summer, this one might be better read later in the year. This one sounds like it'd be one of those reads when you feel like you wanna read something deep. I like the fact it sounds like you take something away from the book and still think on it afterwards. Im glad you enjoyed some parts of it but the ending was a bummer and took away from it, it sounds like. Lanie - It is a thought provoking read--at least to me. :-) Emotional, anyway. It does say something about a book when it stays with you after you've finished it, doesn't it? I actually liked the ending--it fit with the rest of the book--but for some reason this book just threw my emotions out of whack, and left me feeling not as hopeful as perhaps the author might have hoped. So, yeah, it was a bummer in that way. This books sounds interesting, though probably not an ideal choice for me. I have a feeling it may touch on the issues I really don't appreciate in novels. Besides, I prefer happy endings (or, at least, clearly hopeful ones). Great review! A.M.B. - I thought the ending was clearly hopeful. It was just me not being able to get over the rest of the book. Haha Still, I know what you mean about not wanting to read books that deal with certain issues. Sometimes I find myself reading them anyway. I had the same reaction as you did. Liked the writing, but the character left me cold. The book in general left me with a bad taste in my mouth. Carrie - So it wasn't just me? That's nice to know. Annie was an interesting character, but not one I liked very much. Great review, Wendy! This sounds like a book that evokes our emotions and makes us think. I'll have to check it out. Melody - Thank you! Yes, the author did do that well--making me think and evoking my emotions. I hope you like it if you read it! You have certainly intrigued me with this review. I prefer to like my characters, but like you, sometimes the story just doesn't allow for a sympathetic character. Jenclair - That's my preference too, but, as you said, sometimes it just doesn't work out that way. I have A Small Indiscretion on my TBR pile. It sounds like it a beautifully written about the past that comes back to haunt someone. It sounds like the author brings Annie's pains to light really well. Naida - I did think it was beautifully written, and I hope you like this one. I look forward to reading your thoughts on it when you get to it, Naida. I'm curious what you'll think of it. Looks like this one was a mixed bag. Some things were done well but it could have been better. I'm also not too sure about it from the description, maybe I will have the same troubles with it. Athira - The description doesn't really capture the book well, I don't think. But that could just be me. I am glad I read this one, although, like you said, I did think some areas could have been better. Wonderful review! I have seen this one and it seems like it would be a good drama but it is hard when we don't quite form a connection with the main character isn't it? I'll keep this one on my radar. Iliana - Thank you! Yes, I am a reader who likes to connect with the main character--although I've enjoyed books where that hasn't happened. It's more my preference than a general rule, you could say. Samantha - I hope you do like it if you try it! I couldn't stop reading. I wanted to know what would happen to Annie and the other characters. I may not have been their biggest fans, but I did come to care about them. I've seen mixed feelings about this one, and this is such a balanced and thoughtful review. I don't know that I'll end up reading this myself, but thanks so much for sharing! Shaina - I have seen mixed reviews for this one as well. Most of the less than positive reviews seemed to take issue with the main character. In a way, I think that is what helped me appreciate her more. I was able to see her in a more objective light than I might have otherwise.